As racism rears its head after the EU referendum, a chain set up to counter sectarian education is offering solutions for the UK. In a horseshoe, sitting around teacher Laura Clarke, year 1 pupils from Redfield Educate Together academy in Bristol discuss the EU referendum. “Do you remember what happened?” asks Clarke. “There was a vote and people were unkind to people from other countries,” pipes up Ben Wycherley, aged six. “How do you feel about that?” Clarke asks her class. “Shocked,” says Tarren Dwyer-Reid, also six. “Sad,” says classmate Angelo Marmolejo, whose parents are Spanish. “How do you think being unkind might make other people feel?” asks Clarke. “I’d feel lonely,” says Zoe Papp. “Not very welcoming”, written up on the whiteboard, is the phrase that seems best to sum up the children’s view. 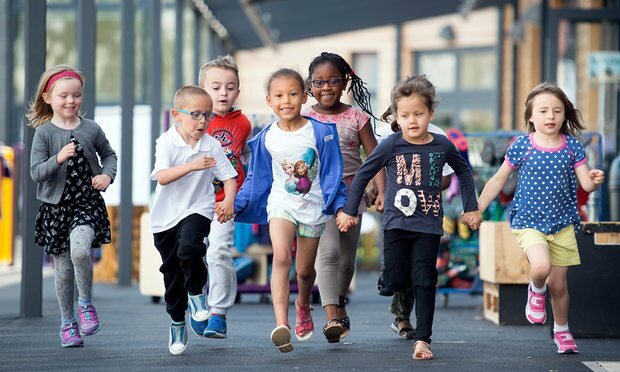 This new school – the first established in England by the Irish Educate Together multi-academy trust – serves a diverse catchment in central Bristol: 60% of children come from black and minority ethnic backgrounds. The city, like others, is feeling anxious after incidents of racial hatred and immigrants being told to “go home” following the referendum. One local primary school posted a notice on its Twitter feed offering to help families report racism and hate crime. The headteacher here, Ros Farrell, is keenly aware that her school’s unique “ethical education curriculum” is needed as never before, as its children grow up in a multicultural city where a higher than expected 38% of voters opted to leave the EU. The ethos of this chain of schools was developed in the Republic of Ireland – the first was founded in 1978 to offer an alternative to faith-based education, still the only option for 97% of pupils there. Educate Together’s “ethical education” approach, Farrell says, is intended to help children understand and value belief systems other than their own, and explore concepts of equality and justice. The trust, a secular educational charity, has opened 60 schools in the past 15 years, becoming the leading provider of new state schools in Ireland. In the Dublin region, its schools report applications in excess of four times their capacity. It opens another nine schools this summer, and the Irish government wants a total of 400 by 2030. The increase, says the CEO of Educate Together, Paul Rowe, is due to “a huge shift in parental attitudes towards preparing children for a future in which they’ll be working with people from across the world.” The first school was formed, he says, “by people who wanted children from different religious backgrounds to be educated together in a context of rights, respect, and with the profound commitment to the idea that children should be treated with equality of esteem in everything a school does”. With the current divisions and uncertainties in the UK, Farrell believes there has never been a more important time for this educational philosophy. Healing painful rifts, when the world feels increasingly insecure and vast movements of people are taking place, will require children to be able to draw on skills of empathy and communication, she feels. Rowe, over from Ireland to discuss the opening of two more schools in the autumn, points out that while this school’s young pupils will remember little of the referendum vote, they will be affected by it throughout their lives – which for many will stretch into the next century. In that time, the world will transform from what we know now. As Olivia heads off to class, her mum knows that in this school, at least, she is safe, and is being equipped to do more than simply achieve academically. Rowe is adamant that the resilience the Educate Together philosophy has fostered in the trust’s Irish schools needs to become more widespread. “For a child, to speak out, to interact with authority, to have the skills to deal appropriately with hurtful or bullying behaviour, it’s about trying to generate the confidence of the individual person,” he says. It seems to be working. Back in the classroom, the year 1s list the items a refugee child might need in their rucksack, and describe the messages they wrote to world leaders about their plight. It’s not just about feeling empathy, says Farrell: the children are taught to take action. And their letters will soon be in the post.